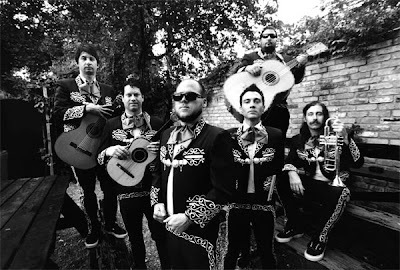 One wouldn't expect a band like the Bronx to dabble in trying their hand at Mariachi music. Firstly, they are a punk rock band.The last time I checked, crusty guitar and vocals that sound like the frontman decided to spend all of the money from their gig checks on Lucky Strikes and hard liquor weren't part of Mexico's distinguished cultural heritage. Secondly, they are all white. The closest ties anyone in The Bronx has to Mexico are the same ties that San Diego State fratboys have to it, a couple drunken nights in TJ. Taking this all into account, El Bronx has no right to be as good as it is. The Bronx' Mariachi El Bronx alter-ego isn't some punk rock revisioning of the background music to your favorite taco joint. It is as close to authentic as a bunch of white boys from Los Angeles could possibly make it. El Bronx is awash in swinging Latin rhythms, brimming with lively horns, nimble flamenco guitar, vibrant strings, and traditional percussion. The Bronx even recruited Vincent Hidalgo, son of Los Lobos' famed David Hidalgo, to play the guitarron and to show off his accordion chops, which he does convincingly on "Clown Powder". While at times El Bronx reaches into spaghetti western territory, e.g. "Silver and Lead" and "Holy", it never crosses the line into parody. While sung in entirely in English, El Bronx shows off a new side of vocalist Matt Caughtran. The raspy bark that has become the one of the identifiable features of The Bronx, has been toned down to a gentle croon that surprisingly compliments their new south of the border stylings. The abstract lyrics that one would expect from the Bronx are still found in places on El Bronx but have mostly been replaced by stories of romance, further fitting with the Mariachi vibe. There is no way in hell anyone would expect a Mariachi album recorded by some LA punks to be good, let alone great. Flying far above novelty, El Bronx is one of the year's most welcome surprises. If only more bands would flex their creative muscle in the ways that the Bronx have here.